Fouad Laroui: The Curious Case of Dassoukine’s Trousers | shigekuni. Maybe the particular quality of Fouad Laroui’s humorous fiction is best described with a phrase from his 2010 novel Une année chez les Francais, a supple, warm boarding school novel. A family of rich French expats living in Casablanca suggests to the novel’s Arab protagonist that he may find quotidian details about Morocco banal that they still grapple with. Silently, the boy disagrees. “Rien, absolument rien, ne lui a jamais semblé banal.” Despite the fact that Laroui’s fiction is not necessarily grounded in a prose of observation, I got a similar feeling from the books of his I’ve read: a writer who is aware of all the oddities of how the world around him works and holds these oddities up to the light, with a biting but gentle intelligence, a warm sense of humor, and a smart linguistic inventiveness. 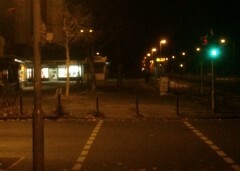 Given the readability of his work, it is a bit puzzling that none of his work has been translated into English so far. This oversight has been amended this year with the translation of The Curious Case of Dassoukine’s Trousers, a recent collection of short stories. The translator is Emma Ramadan and the publisher is Deep Vellum, who made quite a splash last year with the publication of Tram 83, possibly hoping to repeat that surprise success by offering anglophone readers the gift of a hitherto untranslated but substantial and important writer. I’m not a great reader of short stories, and so I would have suggested maybe a translation of one of his novels (the mildly kafkaesque and beautifully inventive La vieille dame du riad would have been a great candidate) instead, but I understand the choice. Laroui is not by temperament a novelist (despite having written a ton of them), and his short stories are very short, boiled down to one specific idea (the titular story is about 10 pages in my edition) and absolutely hilarious; moreover, this collection won the Prix Goncourt when it was published in French in 2013, so it makes sense. The next project of Ramadan is Laroui’s other recent prizewinning novel, Les Tribulations du dernier Sijilmassi which won the Prix Jean-Giono in 2014, an excellent novel that you should be very impatient to see in translation. Meanwhile, getting The Curious Case of Dassoukine’s Trousers as a first offering from Laroui’s large (he writes with a productivity that rivals TC Boyle’s stories/novels rhythm) oeuvre, of which I have read but a fraction, is no consolation prize. This is a fascinating book and an interesting display of many of Laroui’s strengths. If you want a writer who writes about Morocco, exile, dictatorship, with a knowing, but light and gentle hand, read this. Even if you, like me, are a bit averse to short stories, I promise, this is time well spent. Laroui does interesting things with the form. Read this, but more importantly, whenever one of his novels becomes available in translation, read that! Laroui’s stories, more even, as far as I have read them, than his novels, are concerned with discussing history, nation and identity. A vast plurality of the stories in The Curious Case of Dassoukine’s Trousers are written as conversations, and the equally excellent collection Tu n’as rien compris à Hassan II even has the conversational scene inscribed into the title through address. Laroui’s stories do not follow someone’s experience from an omniscient or limited narrator – they are less stories than tales, and the audience of the takes is present in the stories itself. The stories set in Morocco are almost all set in Morocco’s history, and I’ll return to that aspect in a second. What this means, with all the talking about telling stories, is that these collections are full of disquisitions about how to talk about history. How do you talk about the past? What does it mean to have a reliable memory? History, in the Laroui books I have read, is something created by Moroccans together, by talking about the past, and in many ways, Laroui’s books themselves can, and I think should, be read as contributing to that same conversation. In La vieille dame du riad, a French couple, drawn with sharp, but kind satire, is confronted with an odd but difficult situation in Morocco. A young man promises to explain. Instead of just doing so straightforwardly, he writes a whole novel, which forms the core of the book. It is a novel about history. Thus, Laroui’s themes keep returning in his work. The different ways of framing conversation and memory (a form of, I suppose, Halbwachs’ collective memory) are one of the great strengths of The Curious Case of Dassoukine’s Trousers, apart from the immediate pleasures of Laroui’s observations and humor. The other stories, which are not concerned with memory, are about being an exile. They are a bit hit-and-miss. The excellent story “Dislocation,” in a circling movement of repetition, slowly strips a man who lives abroad from all his illusions, resulting in a bleak statement of alienation and loneliness, apart from the (sometimes controversial) final tableau. A different story, about a long-distance relationship on the rocks, is not as successful. But the few down moments in his work are few and far between. Reading his work, one gets the impression that, at this point, Laroui has mastered the tone, humor and style of his stories, and they are remarkably consistent in quality. Fouad Laroui was born in Morocco in 1958, went to a French-speaking elite high school in Casablanca (the first year of which is recounted in the extraordinary autobiographical novel Une année chez les Francais), then studied in Cambridge and Yorkshire (which experience he drew on for the hilarious La Femme la plus riche de Yorkshire). Eventually he moved to Amsterdam to teach. He publishes with some regularity novels and short stories in alternating rhythms, and is particularly successful in Morocco, where, according to some, his books are regularly sold out. He recounts some funny habits of Moroccans (always aware of the distance between caricature and realism; his short Romeo and Juliet-like novel De quel amour blessé ends with a postscript, wherein a character exclaims, critically, “C’est du guignol. Les personnages sont des stéreotypes.”) and some strange quirks of life in Morocco and as an exile, but almost always, these observations are laced with a profound sense of history. I’m not going to spoil any of the stories (which, in structure and twists, are eminently spoilable), but, speaking in broader terms, a story about some Moroccans making do with a school requirement is laced with the knowledge of how dangerous it is to upset some people, and where, during Hassan II’s time, power truly lay. Another story has its characters cautious because a new acquaintance may be trying to report on them. In both cases, these elements are not necessary to the story, strictly, speaking. Both stories could have been told without them, but Laroui’s work is more than funny. It is critical in a way that communicates that criticism to his intended audience without offending them, or being too heavy-handed about it. None of Laroui’s work has been banned, for example, despite sometimes the criticism, the abyss behind the light words, being quite brutal. For example: Une année chez les Francais is a novel about Laroui’s own first year in French high school in Casablanca. It contains many explicit digs at the society of that time, intelligently dismantles illusions of class and nationality and more. But when we look at how it corresponds to Laroui’s own life, the decision to make it just one year, which has textual and intertextual relevance, also means that the novel cuts off just before Laroui’s father, the following year, vanishes, most likely into one of Hassan II’s jails. This autobiographical fact turns the incessant quips about “what does your father do?” that keep cropping up in the novel into dark hints at an ugly historical (and deeply personal) fact. You can read the novel without that background, and it is still a great book, but the interaction with Laroui’s intended audience serves as a rich background without bringing down the tone of the book or making the book vulnerable to political criticism. I was about to write: “there’s no case in The Curious Case of Dassoukine’s Trousers where the surface reading, and the reading of the intended audience are so far apart,” but the truth is, they may well be. Apart from the few things I spotted, the book is likely crawling with small hints and contexts. Some of these are barely of relevance to me, and I wonder if Emma Ramadan annotated her translation to include them. The title story (which you can read here, by the way), a humorous tale, is told by a man named Dassoukine, who, trying to purchase grain from a European consortium, suddenly finds himself without trousers. I am fairly certain that the story pays homage to the famous Moroccan funnyman/humorist Mustapha Dassoukine, but being unaware of his body of work, this knowledge doesn’t really add to the story. Or another reference, later in the book. A group of friends meet in a café called Le Café de l’Univers, which may well refer to a chanson by Claude Semal (Au Café de l’Univers), the final stanza of which ties the story to the collection as a whole and the title story. I read this online. I would never have guessed it nor does it add substantially to my appreciation of the stories, and yet, I don’t find my reading of them lacking in the least. It is Laroui’s skill to write fiction that is open enough to be read and enjoyed by a wide audience, but specific enough to be read and understood by a local audience. For another example, see translator Lydia Beyoud’s comments on the cigarette brand Casasports in a Laroui story she translated (you can read the story here). Yet these examples are but the tip of the iceberg. A much larger set of allusions and hints is in the language itself. Everything I said so far was about content rather than language specifically, and yet, the language of his work is the real treasure. 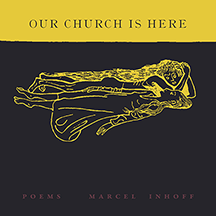 Apart from puns and jokes scattered all over his work, Fouad Laroui is very aware that he is a writer writing in French (his poetry, meanwhile, is written and published in Dutch). 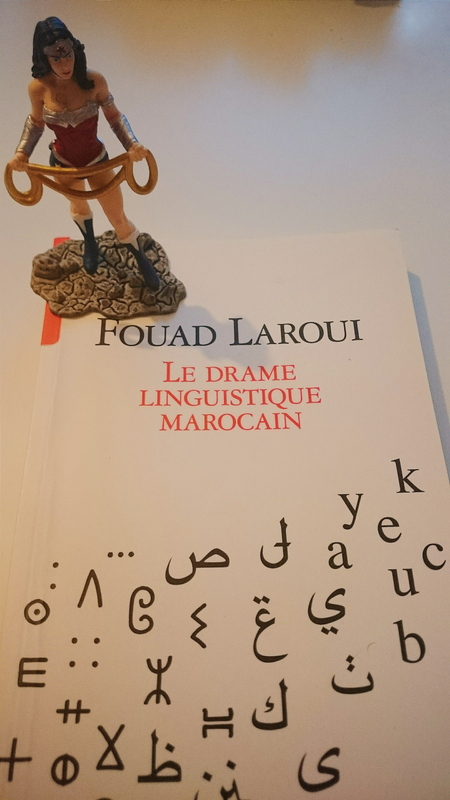 In his very intriguing book Le Drame Linguistique Marocain, which I read over the weekend, Laroui dissects the unique linguistic situation of Morocco. The main focus is not French, it is the tension between Arab as a literary language and Darija, the dialect spoken by people “on the ground.” There is no real literature in Darija, but Moroccans do not universally read classical Arab, which limits the scope of Moroccan (and, by extension, most of Arab) literature. French is, understandably, another layer. Laroui points out that while Arab is the official language, sometimes officials will speak French rather than Arab. Moroccan literature in French is, according to him, ‘a monster which doesn’t want to die.’ If you think this is a curious way to talk about one’s own work then you misunderstand the truly odd and complex way that Moroccans think about their literature. 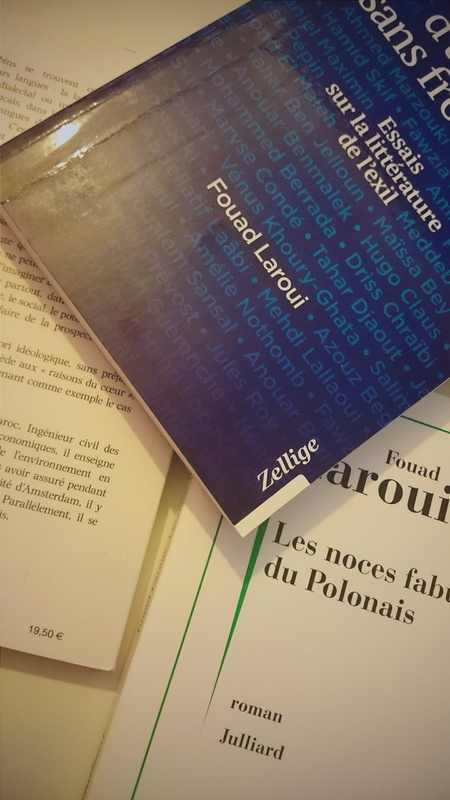 It is fairly strange to think of a nation’s literature as being completely untethered to a language (among the examples Laroui gives are, imagine if “La Cantatrice Chauve” was considered classic Romanian literature), and yet, Laroui cites multiple Moroccan intellectuals who forward just that claim. So, is The Curious Case of Dassoukine’s Trousers a Moroccan book? In addition to its themes and the nationality of its author, what really makes it Moroccan is the book’s odd use of (and sometimes allusion to) dialect. It is a book in French, but reading it, I had to think of a remark Laroui makes when he details how different Arab writers have coped with dialect. He mentions Nagib Mahfuz as a particularly masterful user of literary Arab – in his work, according to Laroui, while we find no Darija, per se, we find an artfully turned literary Arab language that, to knowledgeable readers, lets the dialect shine through. I suspect, in some dialog, Laroui is doing the same. In some places we can see it. There are French terms which he ‘misspells’ to reflect Arab pronunciation, and some of his novels contain borderline unreadable chunks of dialog that are Darija/Arab inflected French (Some early portions of La vieille dame du riad stand out particularly, hilariously) In other places, we don’t see it. Earlier, I talked about the stories sort of metafictionally discuss the importance of creating a collective memory through dialog, stories that, performatively, are part of that dialog. Language, clearly, is an important part of the same process, and the Moroccan diglossia, as Laroui describes it, provides an odd dynamic for that process. In Le Drame Linguistique Marocain, we have an author who is incredibly insistent that the dialect Darija is the true mother tongue of Moroccans and needs to be given a greater role in education, literature and culture. 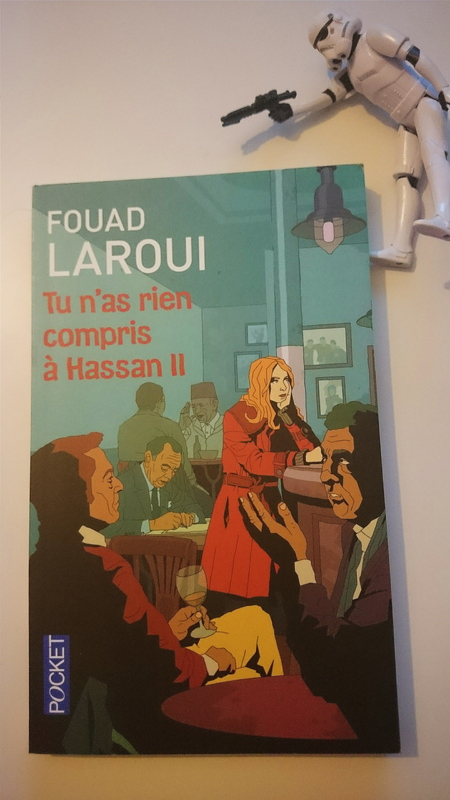 The case is persuasive and the book is detailed and exact, and yet, Fouad Laroui writes in French (and Dutch). What to make of this? Maybe this adds to his insistence, and it is, I think, part of the explanation of why his satire and humor is embracing rather than just bracing. I feel like there’s a melancholy and urgency to his whole project that cannot be summed up by one or two stories alone. I started this review with a reference to Une année chez les Francais, a story about a young boy who has been raised in French, among people who speak almost exclusively Darija. Mehdi, that novel’s protagonist barely speaks Arab, and his situation between dialect, Arab and French is a tense and difficult one. In Laroui’s followup novel, similarly autobiographical, Les Tribulations du dernier Sijilmassi, an engineer returns to Morocco to find himself, and finds his vocation: becoming a writer. This sense of vocation and urgency is felt in most of the work by Fouad Laroui I have read, and accompanies (rather than replaces) the humor of the fiction. And look, maybe I imagined it because he doesn’t talk about it in interviews, maybe these are just funny stories with none of the urgency that I read into them, but why don’t you read his work and find out for yourself? 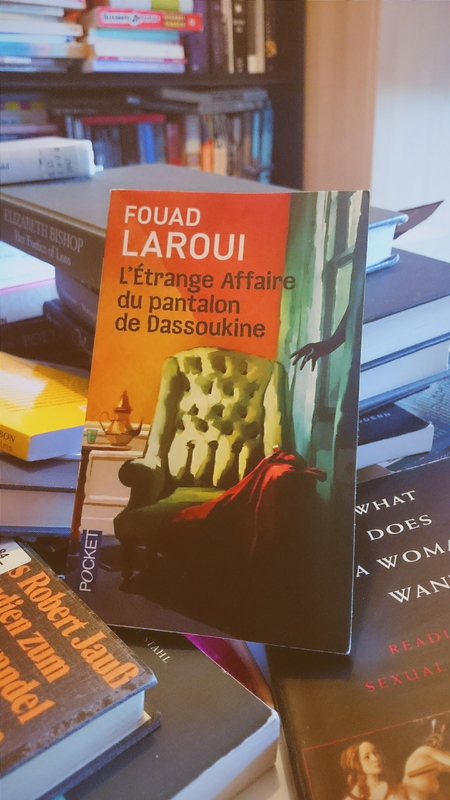 L’Ètrange Affaire du pantalon de Dassoukine is maybe not my preferred starting point for Laroui’s work, but it’s a good one, and it is available in translation. Go. Read.